Get the appearance of a non-surgical face-lift at home. Firming up your face can be done without spending hundreds of dollars on face-lift creams, Botox or surgery. 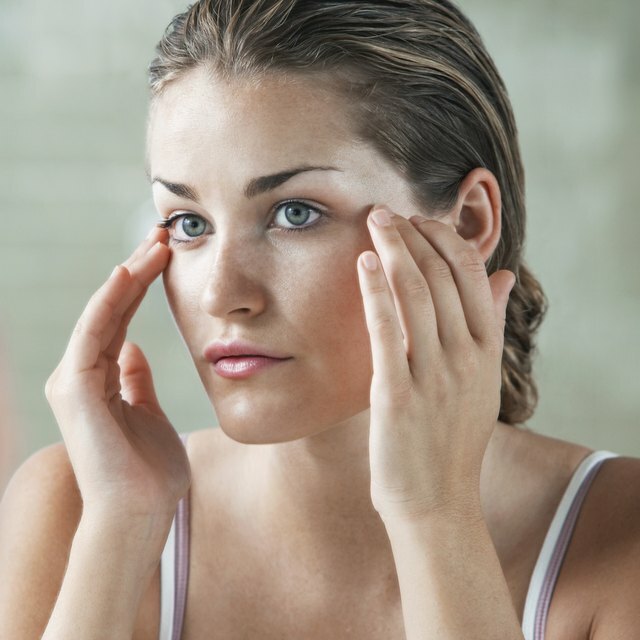 Both aging and environmental exposure can cause you to have wrinkles, blemishes and loose skin. By taking better care of your skin, both from the inside and the outside, you can help give the appearance of healthier, less-aged skin. You can improve your skin by consuming a better diet, and you can pamper your skin with facial treatments you can create and apply at home. Some of these methods take time, and won't work overnight. However, if you establish a good facial beauty regimen, you can see a more youthful look to your skin over time. Eat a better diet to improve your skin's youthful appearance. The MayoClinic.com website notes there is evidence that certain vitamins in food can protect your skin, though more research is needed in this area. The vitamins you want to target in your diet are A, B3, C and E. Vitamin A-rich foods include carrots, spinach and kale. You can find B3 in salmon, tuna and mushrooms. Find vitamin C in citrus fruit and strawberries, broccoli, cantaloupe and papaya. Vitamin E is found in avocado, spinach and olives. Drink plenty of water. Water helps keep your skin hydrated. Keeping your skin hydrated makes your skin less prone to wrinkles and blemishes. Drinking a lot of water itself can contribute to improved skin. Water flushes toxins out of your body. Drink eight to 10 8-oz. glasses of water daily. Make an egg-white face mask. Egg whites can help tighten skin pores, which can give you the appearance of an instant face-lift. Use one egg white, a few lemon juice drops and half a teaspoon of vitamin E oil. Whisk the ingredients together in a bowl. Apply the mask to your entire face and neck. Leave it on for 10 to 15 minutes, then wash with warm water. Make a carrot face mask. Carrots contain a lot of vitamin A. In a food processor, add four large carrots, two cucumber slices and four strawberries. Mix with one egg white, and add a little vitamin E oil. Apply to your entire face and leave it on for about 15 to 20 minutes. Wash with warm water. Make a honey and avocado mask. Combine 2 tbsp. of honey, 1/4 cup of mashed avocado and one egg white. Apply the mixture to your entire face and leave it on for 15 to 20 minutes. Wash with warm water. Make a cucumber face mask. You'll need 2 tbsp. of cucumber juice. You can use a blender to make cucumber juice, as most stores don't carry actual cucumber juice. Combine the juice with one egg white, a few drops of vitamin E oil and a teaspoon of lemon juice. This is great facial mask for the eyes. Apply to the face and leave it on for 10 to 15 minutes. Rinse the mask off with warm water. Do a patch test on an inconspicuous part of your skin to test out the masks before using them. Wait 24 hours and check to make sure you don't have an adverse reaction to any of the ingredients before applying to your face.